MadCap Software recently invited me to blog about how new users can improve their MadCap Flare skills without spending a dime. I quickly came up with a bunch of no-cost ways to improve one’s Flare skills, which I’ve consolidated into the following seven ideas. Although you can tackle them in any order, I suggest that you study up on CSS early in your learning, so I’ve put that first. Even if you are a Flare newbie – especially if you are a newbie – bone up on your knowledge and use of cascading style sheets (CSS), which undergird Flare’s power and flexibility. The best free place to learn CSS is from w3schools.com, starting with the CSS Introduction. You’ll find comprehensive documentation of all CSS classes and elements, replete with examples to copy and paste into your own stylesheet. You can also readily experiment with the “Try it yourself” feature with which you can tweak a style’s definition and immediately see how it renders. Start by learning about basic CSS syntax and the box model, and then move on to specific properties such as borders, fonts, rounded corners (ideal for notes and warnings), and float (typically used to float images around which text wraps). Once you’ve got the basics of CSS under your belt, you can then tackle Flare-specific styles such as those for cross-references, which you’re likely to want to render differently depending on the type of output (online vs. print). It’s CSS that makes that magic happen. And no matter where you learn it, be sure you understand stylesheet mediums. Many a new Flare user (and some of us veterans, still) get twisted up sometimes by inadvertently working in the wrong medium. I think it’s the rare user who can just open up Flare and start making good output. Maybe it seems trite, but I believe we should all Read the (ahem) MadCap Flare Manuals! Or, put another way: Look. Stuff. Up. 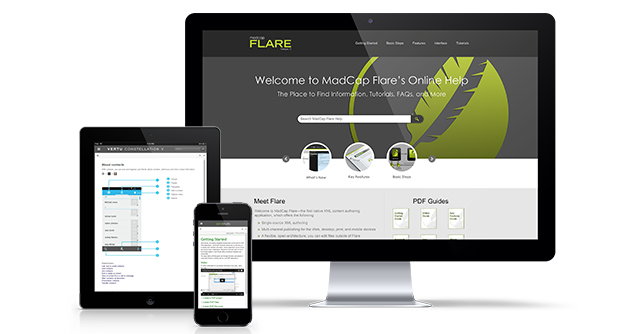 If you prefer to read web pages, you can view the MadCap Flare online Help system directly in a browser, instead of within the Flare application. I like to have Flare open on one of my two monitors and the Flare Help system open on the other monitor. I also like reading the Flare PDF manuals (I know, my age is probably showing) because I can download them to my computer or iPad and then read them at my leisure. I highlight stuff, bookmark sections I want to study in more depth, and even (on my iPad) scribble in the margins. The Flare documentation sometimes takes some lumps from users for being a bit bloated, and I have my own nits to pick about it. But overall, I find the Flare documentation to be comprehensive and considerate of the varying needs of its users – from newbie to expert. I’ve had the pleasure of meeting MadCap’s tech writers several times, and I know that they are passionate about what they’ve produced for our collective benefit and about continuously improving it. Recent updates include the How Did You Do That? tutorials in the Help system. There you’ll find blow-by-blow descriptions of how to achieve some sophisticated outputs from Flare such as press-quality printed brochures. As a former teacher, I can readily see that MadCap understands learning theory and works hard to accommodate different learning styles. Not everyone learns by reading. If you are a visual learner, sign up for MadCap’s popular live webinars. If the times aren’t convenient for you, you are still in luck! 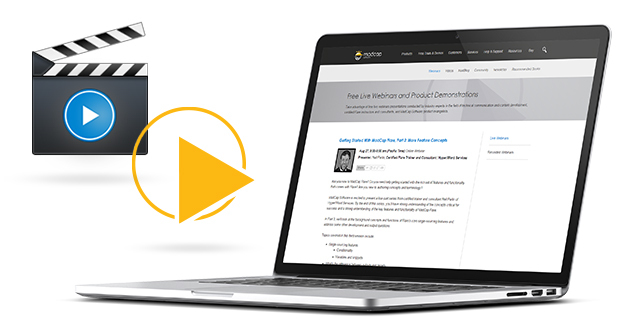 Check out the hundreds of hours’ worth of recorded webinars in their webinar library covering topics from advanced table styles to top navigation output. Plus, there’s a nice collection of video demos and tutorials. The Flare community is large and diverse, from all over the globe and includes newbies to experts. It’s easy and tremendously beneficial to follow and become part of the wildly active community. First, check out the official MadCap User Forums. There’s no limit to how many questions you ask there (and the only “dumb” question is the one not asked). Soon enough you’ll probably find yourself answering questions for the newbies that come after you. Next, there is the LinkedIn group Users of MadCap Flare. Some people use this group as an alternative to the official forums, while others use it to post interesting and often provocative questions for the community to consider. I find it a fun place to learn from others’ authoring challenges and to share my own. Finally, and very dear to my heart, are local Flare user groups. Such groups serve the unique needs and interests of their members. Even if everyone in a group is a newbie, I believe user group members greatly accelerate their learning when they join forces. As of this writing, MadCap’s Community page provides contact information for 23 local user groups in North America, Europe, Australia, and the Middle East. Unofficially, by a list I’ve volunteered to manage, Flare users in 26 additional locales are interested in forming user groups. And some groups, including my own group in Rochester (NY) and the group in Melbourne, Australia, have been successfully experimenting with holding meetings online using free services such as Skype group video calls. Getting involved with these groups is the key to success! *If you know of other Madcap Flare bloggers or if you are a Flare blogger, please add a comment to this article to share your name and URL. We’d love to follow you! 6. Play in your sandbox! Maybe you’re a hands-on learner. If so, I’d recommend that you get your hands dirty by working on as many practice projects as you can! I suggest three approaches for practicing with MadCap Flare, in this order. Create “sandbox” projects based on the factory Flare templates. Flare 11 has 23 templates, so pick a few different kinds (e.g., Top Navigation Basic, Brochure 3Fold, and User Guide Advanced) to test drive. Then study them. Examine how their TOCs are structured. Peek under the hood of their stylesheets. Examine some of their topics. Look at where things are stored in the Content Explorer and how files are named. Generate their targets. Create “sandbox” projects by importing content from another tool. At some point, you are likely to want to use Flare to import content from a tool you’re leaving behind, such as FrameMaker®, Word®, or RoboHelp®. So create a new project and import content straight from that other tool. Then observe what you get. You’ll probably quickly conclude that you’ll need to do some cleanup in the legacy source files before importing into Flare. So do that and then create another new project and import again. Experiment with importing until you have a good understanding of the pre-import and post-import tasks that you’ll need to do and which Flare features can help you. Create an “empty” Flare project. After all the above experimenting, also try your hand with a completely empty Flare project (there’s actually a template called Empty). Create some topics and snippets from scratch. 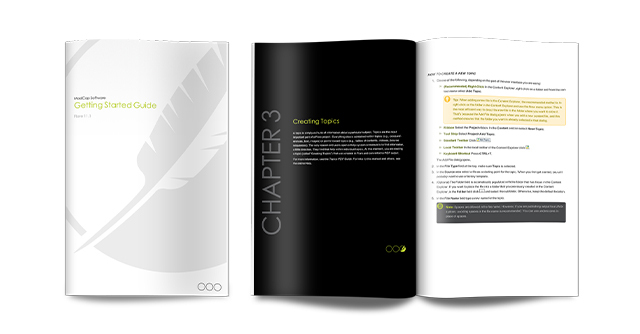 Build a TOC from scratch. Edit the default stylesheet. Adapt the default skin for online output. In short, play with Flare and get comfortable with all its varied functions. Lastly, with the release of MadCap Flare 11 and its game-changing Top Navigation output, any Flare user seeking to push the boundaries of online output needs to learn the basics (and then some) of responsive web design. And specifically, for all Flare users migrating existing work to Top Nav, it’s important to get familiar with Zurb Foundation, upon which Top Nav is built. Huh? How can writing stuff down help one improve one’s Flare skills? Because I can guarantee that you just won’t remember everything you ever do in Flare. If you take the time to keep good notes, to document where an idea came from and what design problem you solved with it, then the next time you’re faced with that same design challenge, you won’t have to reinvent that particular Flare wheel. And before you know it, you’ll be a MadCap Flare master user. As owner of Nita Beck Communications and a MadSkills consultant, Nita offers technical communication and information architecture services to clients around the world, including Flare project design and customized Flare training. She is a certified MadCap Advanced Developer and manages the Rochester Flare User Group. Spot on as ever, Nita – especially the write it down part. I did a few difficult bits without taking notes and then had to re-discover the way I did them. I found the W3schools info very useful as well, easy to use and welll laid out. Great tips! I keep a “Useful Information” folder where I put all the stuff I might need later – configuration info, forum tips, etc. Saves me a lot of time. No need to remember where I might have put last month’s notes on some (suddenly) crucial task. Great blog! I especially agree with your point #6. I tell my students to always have a sandbox play version. This way you can test the new features before you commit your company to them! You can demo new features to your management, too and get their buy-in! Great suggestions! I follow all of these and especially like the blog recommendations. Your last point is also key for me; writing helps me retain information better. My job is to document business unit procedures and it helps to document my own processes as well!